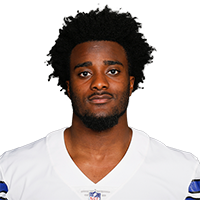 Published: Nov. 30, 2018 at 01:07 a.m.
Dallas Cowboys cornerback Jourdan Lewis lays out for his first interception of the season. Published: Nov. 11, 2018 at 09:25 p.m.
Dallas Cowboys linebacker Jaylon Smith stuffs Philadelphia Eagles running back Josh Adams on fourth down for a loss of three yards. Published: Oct. 7, 2018 at 10:11 p.m.
Dallas Cowboys corner back Anthony Brown knocks the ball out of Houston Texans wide receiver DeAndre Hopkins' arms and causes a fumble. Published: Nov. 23, 2017 at 05:15 p.m. The Los Angeles Charges can't come up with first down on 4th-and-13.